We recently received an email inquiry about David's kinetic sculptures from a person that was researching Dorian Reeds on YouTube. He discovered the following video that combines an incredible sound track with carefully timed video clips. How many different sculptures of David's can you find included? 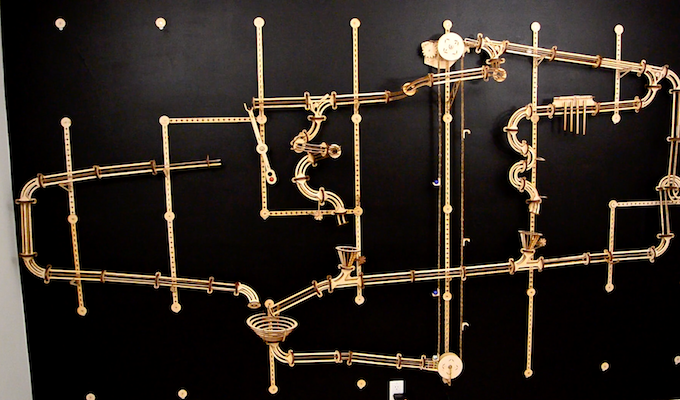 A Kickstarter Project for those who love Kinetic Sculpture! For many of us, the very first kinetic sculpture we encountered was probably a George Rhodes rolling ball machine in an airport or science museum. I know mine was and I remember how I spent a long time fascinated as I followed the various pathways for the descending balls. This kickstarter project is one that makes me smile in the same way. It is by Andy and Keith Johnston and one of them is an owner of a Dimensions! Check out their video. Dimensions is there! Here is a link to there kickstarter page and video. They have reached their funding goal but if you want an early set, you can pledge. 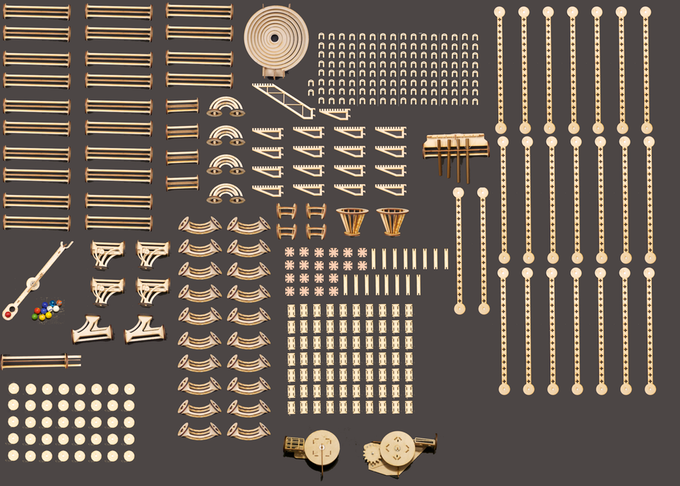 All these parts come with the set. Looks like I need to make bitforms in NYC a regular stop for our occasional visit to the Big Apple. We missed this show of interactive Penguins by Daniel Rozin but also, in looking at the list of past exhibitions, there have been many fun kinetic art exhibitions. I certainly would have spent some time interacting with these dancing Penguins. I have often used moiré effects in the designs of my kinetic sculptures. You will notice them especially in my sculptures with stronger optical designs like Shimmer , Radiance or Illusion. A moiré effect is a “secondary and visually evident superimposed pattern created when two patterns overlap” but they aren't limited to forms in motion. Andrea Minini is a graphic designer based in Milan that uses this effect in a very different application. She creates vibrant posters of abstract animals using the moiré effect. Here are some dramatic examples. Her work is available for purchase from Society 6 or My Modern Shop. Exciting news for those of us who love kinetic sculpture. The Peabody Essex Museum located in Salem, Massachusetts is having the first United States show of the work of kinetic artist Theo Jansen. The exhibition opens September 19th and runs through January 3rd. Most exciting though is coming up in the next 2 weeks are scheduled walks for the sculpture in public places. The first is this Saturday, August 22nd at Cranes Beach from 10 AM- noon. The wind powered structure will take a beach stroll.